And if Coibion-Gorodnichenko-Ulate are right that we are far away from full employment, we shouldn’t necessarily be seeing a deceleration in employment growth. This entry was posted on February 1, 2018 by Menzie Chinn. As the labor market tightens, job growth will slow. Although, it’s early in the quarter, GDPNOW forecasts 5.4% real growth. I watched this interview. Zandi was a bit more careful with his remarks that you are being here. Those are the remarks reported by the press – obviously, you like playing little games. So you did not watch the interview. I did. the data indicates obama had a long term, strong record of job gains. i hope trump can continue the trend obama started. I’m sure the President’s immigration policy won’t have any effect on businesses at all. If the FED had kept interest rates low in 2017 like it did in 2016! The recent decision to raise interest rates is a bit premature as long as the employment to population ratio remains at only 60.1%. Wake me when this ratio reaches 62%. Peak, do you realize you’re quoting an adviser to President Obama, who is discussing EIGHT years of jobs growth (you do realize who was President over 7 of those 8 years, right Peak??). Here are Zandi’s thoughts on a part of Obama’s economics plan. It might interest you to know, Peak, that in 2011 the unemployment rate was OVER 9%. This was when President Obama was cleaning up “W” Bush’s mess that “W” had left smeared on the White House toilet seat. As you [by all appearances] seem to be a Trump lapdog, it might interest you to know Zandi is a Persian name, and Zandi’s father is from Iran. It makes no difference to me, other than having a broad curiosity of the gentleman’s background. But I was wondering, Peak, as a Trump lapdog, did you think this means we should deport Zandi?? I don’t know man, Iran is near to northern Africa, I’m assuming that must frighten many Trump fans. Moses, for someone so ignorant, it’s amazing you assume others are ignorant. All you do is make lunatic comments. Obviously, you don’t know the causes of the financial crisis and weak recovery. Do you expect me to hate Democrats? Why is it important to you Zandi is of Iranian descent? Why would someone’s descent “frighten” me? You make Pelosi look like a conservative, who knows what she’s talking about. Aaaaaaaaawww!!! Peak, you poor thing!!! Did I put a bur under your hiney?? I know you have a school boy crush on Nancy Pelosi, but I think Stormy Daniels is more your type. Visit your nearby ATM machine and Stormy will kiss the little booboo I gave you and tell you that you are the best Republican she’s had since Trump. Moses, you don’t have to prove what I said – I already know. And, the only “PeakIgnorance” here is you. we do know the cause. a major source were the idiot bankers, like yourself peak. now i know, peak will come on here and defend himself by blaming the government (as usual), rather than accept the reality of the situation. but i guess that would be expected of a failed, unemployed banker who helped create the mess to begin with. Baffling – the blame shifter, bankers are very honest – I doubt you could get a job at a bank – you trust politician/lawyers, who have little understanding of the economy. You’ve ignored all the evidence Congress created a giant social program in the housing market and believed a housing bubble would replace the Nasdaq bubble. More evidence that Americans should have voted in Obama for a third term. Oh, wait! There is a 2-term, constitutionally mandated, limit. I guess post-war Congress and the Russians would agree: most American voters are not mature enough for a modern democracy and require a firm, paternalistic and benevolent hand. What you said to the latter point of your comment is so frighteningly close to the truth, that I don’t even dare to chuckle. Menzie, It seems you’re implicitly suggesting that the Yellen-era Fed didn’t do their job as best they could’ve. Do you feel that the Powell-era FOMC will fair better or will they continue the missteps of hitting the breaks? Also, you did a fine job of shading so readers would know the area of 2017… I’m not certain that the labeled x-axis would’ve sufficed. rtd: “…fair better…”? 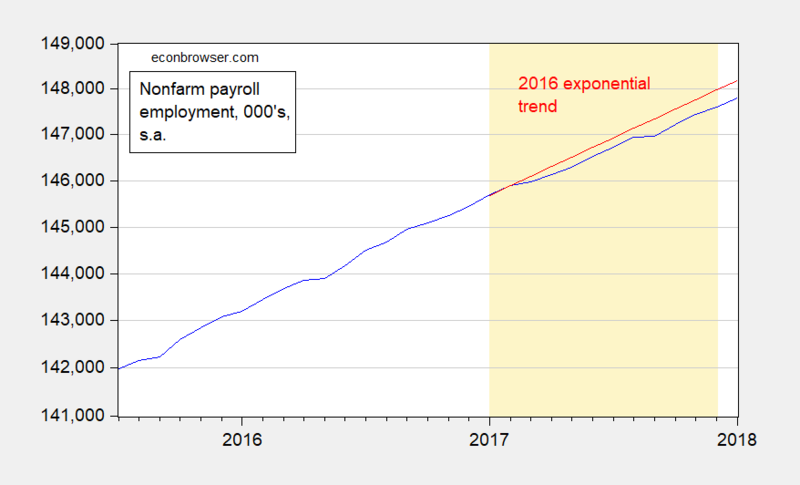 No, just rebutting the assertion that employment growth in 2017 was unprecedented. Thanks – glad you liked the shading. Fare to fair… Siri’s not one to be trusted. But you must feel the FOMC under Yellen didn’t fully do it’s job as the article you’ve selected to cite is largely about monetary policy, including “Methods that do not feature the under-/over-responsiveness problem we document imply that more active stimulus on the part of the Federal Reserve is warranted to enable actual GDP to finally catch up to potential… The benefits of this policy shift would include significantly greater household incomes and higher employment levels than those engendered by the current policy stance.” This could also tie-in nicely to our earlier discussion of earnings. Why do you feel the Fed has been engaging in tight monetary policy? rtd: “…it’s job…”? I think the FOMC under Yellen did its job quite well, but I have stated that (pre-Trump) it was not a good idea to raise rates as fast as was envisioned last year, particularly with the dollar relatively strong. With the election of Trump, and the prospect of an ill-timed fiscal stimulus, I revised my views about what the appropriate pace of rate increases would be. I think I’m going to always use a phone in hopes of more typos. I love your attention to the irrelevant. “I think the FOMC under Yellen did its job quite well”? Despite continually failing to hit its dual mandate? Also, I assumed you linking to a paper that states the FOMC didn’t do its job very well was support of the view. I am afraid the Keynesians and socialist have maintained their command of the language and definitions with in it. Exactly what Milton Friedman meant when he said “We are all Keynesians now,” that the language of economics is such. But that does not mean that such language is best nor should it not change. Supply-side tax cuts should not be defined as fiscal stimulus. Letting people who earn the money and wealth keep more of it, just allows many millions to direct how they spend, save, or invest rather than further empowering committee style bureaucrats to make decisions by spending other people’s money. To allow more spontaneous emergence is not fiscal stimulus but simply good economics for us all. Letting off the brakes is not fiscal stimulus but returning to a natural state. “Supply-side tax cuts should not be defined as fiscal stimulus.” This sentence makes sense (earth to Peaky boy). The rest of the paragraph is Paul Ryan style gibberish. Ed, smoothing-out business cycles resulted in higher growth. Unfortunately, we don’t follow Keynesian economics. Before WWII, taxes and government spending were very low. Today, they’re way too high, particularly with state and local governments. We need to reduce tax and spending substantially, along with reducing the excess regulations, to promote economic growth and strengthen our position to deal with recessions and smooth-out business cycles. We needed a big tax cut to deal with the last recession. U.S. consumers bought foreign goods and foreigners bought U.S. Treasury bonds – trade deficits reached $800 billion a year just before the recession – The U.S. government didn’t refund consumers enough to allow the spending to go on – it selfishly spent too much instead. A big tax cut, rather than the small and slow tax cuts, would’ve closed all or almost all of the output gap by 2011 and limited government would’ve resulted in stronger growth thereafter. So backwards. We cut government purchases after 2010 which is why the output gap persisted. Had we done more government purchases, then we would be at full employment right now. But it seems policy makers listened to your insane advice. Take a bow! YEA! Tell those kids to forget education. And don’t fix our crumbing infrastructure. Tell old people that their health care is to die younger. And all those payroll taxes we have paid since the early 1980’s – no Social Security benefits for us as Koch Brothers need more money. Etc. Etc. Bottom Feeder has spoketh! Pgl, i.e. #1 name caller/complainer, if your President, Senate, and House, in 2009-10, followed my appropriate fiscal policy, there would be more goods & services, higher incomes, more tax revenue, and less debt. Instead, your buddies, like Obama, Reid, and Pelosi, went on a spending spree, till they had spending fatigue, and made the country much poorer than otherwise. You’re a real killer. Thanks for the expensive depression. glad to see a failed banker has the leadership ability and knowledge to run this great country. perhaps we will see you in the next election cycle? nothing but a back bencher monday morning quarterback. The bankers at the Fed are the only ones who know what they’re doing in Washington. Economists should control fiscal policy. And, I don’t know any failed bankers, only politician/lawyers, who failed the American people. And, #1 big spender – pgl – you had your fun. Now, let’s get to work. About smoothing the business cycle, I disagree. Government policy for smoothing has resulted in lower long term growth. Maybe there is a theoretical perfect policy that helps long term growth by smoothing, but don’t look to a few imperfect bureaucrat within an imperfect government to find and implement such policy. Was the policy creating excessive inflation in the 70’s an example Keynesian economics. Yes. Did it have a detrimental affect on long term growth. Yes. And no before WWII, Taxes were not too low, and during the depression and for couple years after WWI, marginal marginal tax rates were much too high. But you are absolutely correct about taxes, tax rates, and regulation. Each needs to be significantly reduced. Ed, boom/bust cycles are inefficient, both in the boom and bust phases, because of periods of strain and slack. Sustainable growth is optimal growth. Boom/busts are caused by government action, generally in monetary policy or inept regulation. There no such thing as sustainable growth without some steps backward. You are thinking in terms of perfection that simply does not and can not exist. You have got to realize that the business cycle with its uneven growth is what is natural and correct. People make both good and bad decisions, the economy is the result of such decisions. Down periods is simply the process of ridding the economy of accumulated bad decisions. There are already better mechanisms over the longer term to ensure more good decisions are made than bad. Such mechanism are many but ethical and moral behavior are part of it. So is self-interest. Proper development of these traits occurs naturally in the transactions of trade, due to the public nature of action. These moral and ethical behavior do not develop under the anonymity and power of government. Self interest can not develop as extensively for the same reasons plus the fact of dealing with other people’s money. I suggest you leave the thoughts of and promise of utopia to the socialist and card carrying libertarians. The illiterate rednecks will remember the VSG’s disingenuous trips to factories and manufacturing plants. Telling LIES to the masses assembled there. But when the FOX camera man leaves for the next VSG propaganda showpiece, what will happen?? I guess FOX “news” isn’t going to break into regularly scheduled brainwashing to show the village idiots this, or even mention it on FOX’s bottom screen scroll.